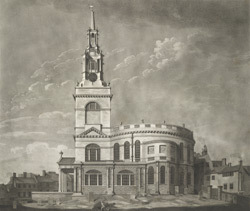 View of the Church of All Saints in Newcastle, designed by David Stephenson and built between 1786 and 1796 at a cost of £27,000. It was built to replace a medieval church, and the new building was in the fashionable Greek style, similar to a number of London churches. The situation of the church made it appear even more impressive, perched on the edge of a steep bank above the quayside.